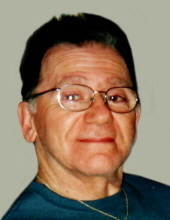 ALESSI - Samuel P. "Buddy"
October 4, 2018, age 85; beloved husband of JoAnn (nee Villa) Alessi; devoted father of Michelle and David (Angela); cherished grandfather of Dominic and David; dearest brother of Mary Marino; also survived by nieces and nephews. The family will be present Sunday from 4-8 PM at the GRECO FUNERAL HOME, 2909 Elmwood Ave. (near Sheridan Dr.). Family and friends are invited Monday at 12 PM to attend a Mass of Christian Burial celebrated at St. Paul RC Church, 33 Victoria Blvd., Kenmore, NY 14217. Please assemble at church. Interment to follow in Forest Lawn Cemetery. Buddy was an United States Army Veteran. Flowers gratefully declined. Share condolences at www.GRECOFUNERAL.com. To plant a tree in memory of Samuel P. "Buddy" Alessi, please visit our Tribute Store. The family will be present Sunday from 4-8 PM at the GRECO FUNERAL HOME, 2909 Elmwood Ave. (near Sheridan Dr.). Family and friends are invited Monday at 12 PM to attend a Mass of Christian Burial celebrated at St. Paul RC Church, 33 Victoria Blvd., Kenmore, NY 14217. Please assemble at church. "Email Address" would like to share the life celebration of Samuel P. "Buddy" Alessi. Click on the "link" to go to share a favorite memory or leave a condolence message for the family.